Stay up to date on the latest in business technology, IT services, and AV solutions. This article was originally featured on ShoreTel’s website here. Wondering what to ask your AV Integrator? Here are 17 questions we’ve compiled as great ways to make sure you are asking the right things when choosing an AV company to work with. Is AV your only area of expertise? With a great deal of AV being put on networks or using network infrastructures, do you have IT network engineers and experts with current industry certifications? Can you offer more than one solution at different cost levels, and explain the functional differences, to help us make the best decision possible? Please summarize your process for completing this project, from beginning to end, and how much total time it will take. Are you an authorized dealer for the products you will design and recommend? Do you have a dedicated project manager that would be assigned to a large project or a project that involves multiple trades? Will you provide schematic “as-built” drawings at the end of the project? What else will you provide in a “closing documents package”? How many of your employees are Certified Technology Specialists? Do you have employees with their CTS-D certificate and CTS-I certificate on staff? What is the average length of employment at your company? Will you provide training on how to use the system you design and install? Will you provide references for similar projects you have completed? What is the warranty of the system you will design and install? Will you provide a detailed Scope of Work for this project, and go over it with us in detail? Do you offer service and support after the installation and training have been completed? Do you offer managed services of this system after the installation and training have been completed? Fill out the information and we will contact you to schedule your free AV assessment! Congratulations to Green Bay West High School! 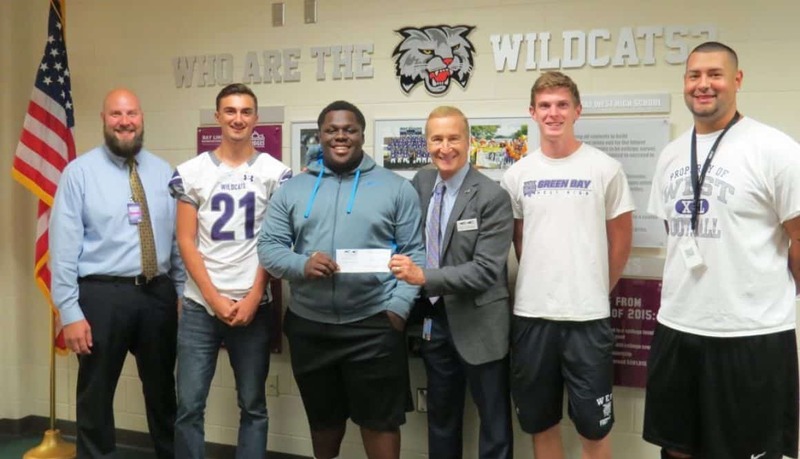 Green Bay West High School was awarded $500 for winning the Quarterback Challenge at the Green Bay Packers’ game! 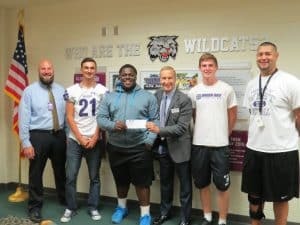 We love being able to give back to our community and support our local schools. Join us in sending them congratulations! 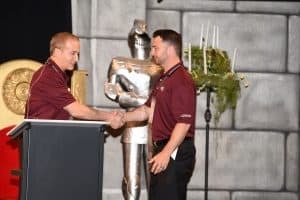 Camera Corner Connecting Point was recognized for its donation of more than $1,800 for the Beagle Freedom Project. Through various fundraisers in the store involving many departments, we were able to contribute to the efforts put forth by BFP to ensure these animals live the life they should! It was an exciting day for Camera Corner Connecting Point (CCCP) on May 23, 2017; not only because of CCCP’s annual technology expo, but also because CEO Rick Chernick announced his son, Ryan Chernick, as the new president of CCCP. That morning, Rick Chernick spoke about the history of CCCP and how his father, Norman Chernick, started the business as a camera store in downtown Green Bay in 1953. 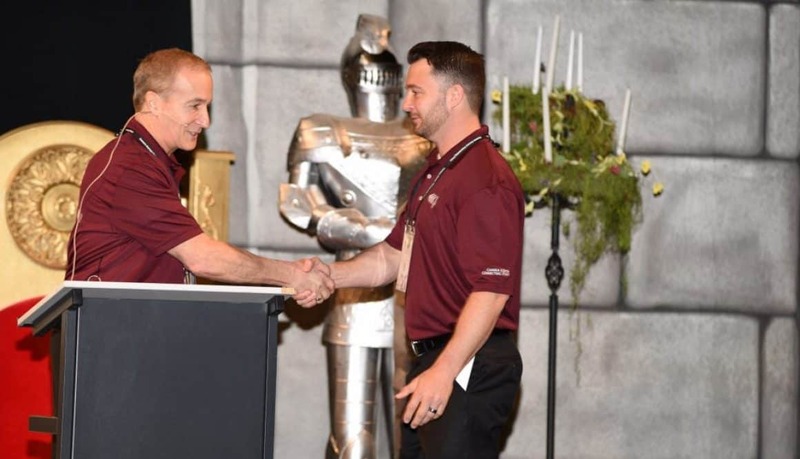 Since taking over the business in the 1980’s, Rick Chernick has grown CCCP into the IT, AV, VoIP and physical security solution provider it is today. As he talked through the history of CCCP, he noted previous president, Earl Neville’s retirement in 2010, and how there has not been a president at CCCP since that point in time. Rick will remain CEO and intends to work for the foreseeable future. in addition, he also explained his goals and plans to continue to care for the customers, employees and vendors like they are family. CCCP is a third-generation IT, AV, Physical Security and VoIP value-added reseller and specialty electronics retailer, serving customers since 1953 primarily throughout Wisconsin, and the Upper Peninsula of Michigan. CCCP’s mission is to provide the latest in technology, backed by best-in-class customer service and support. With a full staff of engineers, designers, technicians and installers, CCCP expertly serves virtually every area of IT, AV, Physical Security and VoIP. For more information, visit www.cccp.com. Getting your camera ready to take those beautiful, summer shots? Here are some tips on cleaning your camera lense! A blower is a good item to have, it allows you to blow off dust without touching the lens. A cleaning kit is a great tool to have! Make sure yours includes a soft cloth, lens fluid and q-tips for removing finger prints, smudges and stubborn dust along the edges. Never spray lens cleaning fluid directly on the lens! Always spray it on the cloth or lens tissue, then clean the lens. Start cleaning at the center of the glass and work your way to the outer edge in a circular pattern with the damp part of the cloth. After using the damp part of the cloth swing over to the dry side of the cleaning cloth and repeat the process. If you have a protection filter on each lens you will never have to clean the lens itself! This is a great advantage as you don’t run the risk of scratching or damaging your lens, just the filter. Filters are easy to repair and cost significantly less to replace than a lens. Make the Best of Your Outdoor Photos with the April Tips & Tricks! Use the lowest ISO setting on your camera—this will help you take the sharpest photos with virtually no noise. Always use a tripod—a low ISO will cause the camera to use a slower shutter speed. A tripod will ensure the camera shake doesn’t blur your photograph. When getting started, use the rule of thirds grid to help compose and create your photograph. This will keep a pleasant composition to your photograph. After you have developed your skills a bit more, you can start to experiment with the rule of thirds to find a distinctive style of your own. Many cameras have a built in rule-of-thirds grid that can be turned on and off. Keep your horizon level—the rule-of-thirds grid will help with this, but bubble levels on your tripod will help. You can also purchase bubble levels to attach to your camera. After you determine your focus make sure to turn off your auto focus so the camera stays focused on your subject until you choose a new composition. Don’t forget to turn it back on when you are done. Always pack rain gear—a camera rain coat sells for less than $10 and can save you hundreds of dollars in repair costs! Now get out there and take some photographs! Green Bay, Wis., March 23, 2017–Camera Corner Connecting Point announced it has achieved exclusive Blue partner status with Datto, the leading provider of total data protection solutions for businesses around the world. CCCP has exceeded high standards of performance to qualify for Blue status in Datto’s partner program, the highest classification provided by Datto. The Blue status includes the utilization of marketing development funds, a hardware insurance policy, free shipping for devices, competitive and flexible pricing, VIP technical support services, early access to new products, and a complimentary pass to Datto’s annual partner conference. Datto Blue status represents the top 5 percent of partners, worldwide. Since the beginning, CCCP has strived to provide its customers with world-class technology solutions. Its partnership with Datto reflects this mission by being a complete business continuity solution, rather than just a backup like many other companies. This gives business owners peace of mind, so whether their harddrive crashes or a hacker gets into their system, they don’t have to be without their internal assets and can continue business as usual. CCCP is a third-generation camera, AV, computer and technology company, serving customers since 1953. CCCP’s mission is to provide the latest in technology, backed by best-in-class customer service and support. With a full staff of AV and security system designers and installers, plus over 30 full-time network engineers and computer service technicians, CCCP expertly represents every area of AV, video security, communication and information technology services. For more information, visit www.cccp.com. Datto protects business data and provides secure connectivity for tens of thousands of the world’s fastest growing companies. Datto’s Total Data Protection solutions deliver uninterrupted access to business data on site, in transit and in the cloud. Thousands of IT service providers globally rely on Datto’s combination of pioneering technology and dedicated services to ensure businesses are always on, no matter what. Datto is headquartered in Norwalk, Connecticut and has offices in Rochester, Boston, Portland, Toronto, London, Singapore and Sydney. Learn more at www.datto.com. ATLANTA, GEORGIA, October 4, 2016 — American ingenuity, the unique ability to apply creative thinking to overcome the most challenging hurdles to success, is something that NanoLumens applies to every one of its installation projects. Recently, this ability was put to a major test when the company was tasked with designing a visually powerful display solution for Acuity Insurance’s new campus theater. Ranked second on the list of top Fortune 100 Best Companies to Work For, Acuity Insurance is a classic American success story that celebrates and supports the value of American ingenuity every day in the service of its large base of American clients. Founded in 1925, the country’s 57th largest insurance provider credits its success to its 1,200 employees and to the United States of America, which creates a wealth of business opportunities for the clients it serves. The question was who could conceive of and then design and engineer the exact solution that would meet the requirements of the space — and that’s where NanoLumens came in to the picture, thanks to Acoustics by Design, the company responsible for developing the new theater’s entire advanced audiovisual system, and Camera Corner Connecting Point, the company responsible for installing whatever display solution was selected. The solution created by NanoLumens is a breathtaking five-sided pentagon 3mm NanoSlim LED display solution that literally galvanizes the attention of everyone who sits in the new theater. Each of the five curved displays measures 10’H X 6.5’W and is joined together to create a single pentagon shaped structure that hangs suspended from the ceiling over the theater’s central stage. The pentagon measures 16’ across the center and weighs a total of 3,600 pounds, including the winch. The calculated weight of the displays is only 1,900 pounds. “We had a very specific weight limit that we had to stay under when designing the display solution,” Camera Corner Audio Visual Systems Consultant Scott Tomashek emphasized. 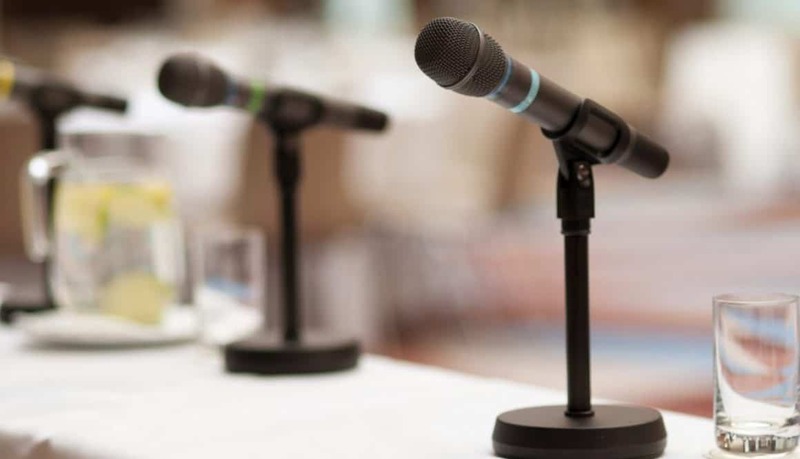 “The NanoLumens team demonstrated their value by creating a superior solution that came in under the maximum weight limit. Acuity, headquartered in Sheboygan, Wisconsin, is a property and casualty insurer that operates in 25 states, generates over $1.3 billion in revenue through 1,000 independent agencies, and manages over $3.5 billion in assets. Named the #2 large company to work for in America, Acuity employs over 1,200 people. Acoustics By Design, Inc., is one of the leading independent acoustical consulting firms in the Midwest. The firm provides acoustical consulting services to architects, engineers, building owners, facility directors, and municipalities. Acoustics By Design also includes an integrated team of consultants who design audio, lighting, and technical systems, and integrate them with the native acoustical environment. Headquartered in Grand Rapids, Michigan, Acoustics By Design serves clients in Michigan, Illinois, Indiana, Ohio, and Oregon in addition to the Pacific Northwest region. For more information, visit www.acousticsbydesign.com. Camera Corner Connecting Point started simply as Camera Corner in 1953, when it opened as a camera store in downtown Green Bay, Wisconsin. From a staff of two in 1953, the third-generation business has grown to a staff of over 120 employees that are involved with much more than simply cameras! The company has expanded its expertise into all types of technology that moves businesses and connects people to their jobs, to information and to each other. Camera Corner Connecting Point is the oldest technology store in Northeast Wisconsin. The firm is committed to provide its customers with quality products and services at the best value. NanoLumens, headquartered in Atlanta, Georgia, creates display visualization solutions that deliver truly immersive customer experiences and great return on investment. We provide unique solutions to problems that haven’t been thought of yet. Our fully custom display solutions provide engaging customer experiences and the ability to realize solid returns on investment. Our brilliant displays, designed and assembled in the USA, are so thin, lightweight and curvable, they fit almost anywhere. With quality backed by an industry leading, Six Year Warranty, NanoLumens is your collaboration partner for visualization solutions that live up to your imagination. For more information, visit: www.NanoLumens.com.